If you pay close attention to the message, you will notice that it does not look very believable. It contains several grammatical errors, which should already be reason enough for you to be suspicious. The fake notification also provides you with a corrupted link http:// cutt.us/facebook-cover-me or http://cover90000588.atspace.co.uk/FACEBOOK-COVER-ME/. If you click on either one of these links, you will end up on an unsafe website created by cyber criminals. You should never click on any links that come from unknown sources. In fact, even if you do trust the source, you should still be very careful, because cyber crooks can use hacked accounts to spread various infections as well. The website to which the links lead you may appear legitimate, but we assure you, it is not. It will ask you to share your email address, password, and date of birth. It will then use this data to steal your account from you. 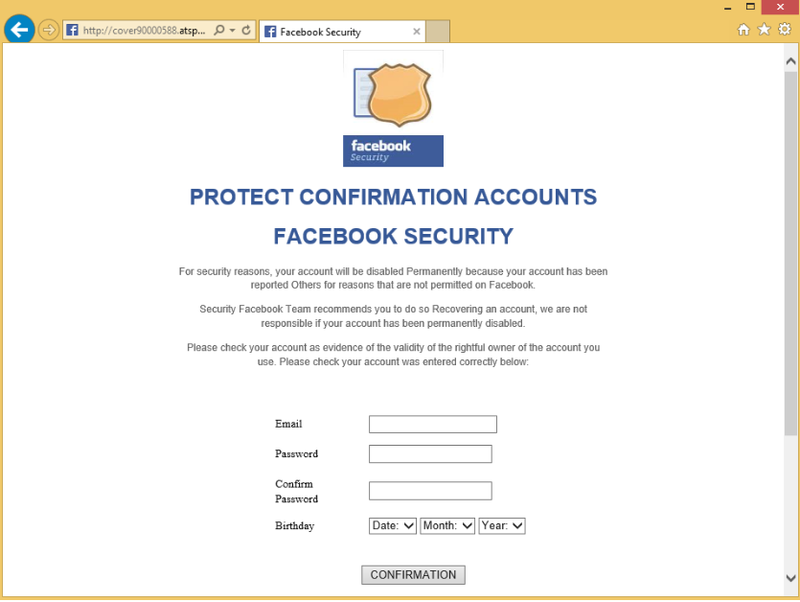 The page will also threaten to permanently close your account unless you confirm your details. This is just a scare tactic used by the hackers to make sure that you share your private information. Do not fall for this trick. Another problem that you may have to deal with, if you actually click on the corrupted link is that you may risk infecting your computer with malware. Needless to say, this can lead to serious problems including data encryption, financial losses, system issues, and more. If you have already clicked on the unreliable link and entered your details into the fake website, there are two actions that you need to take right away. First, contact Facebook Help Center and inform them that your account has been compromised. They will provide you with instructions on what you need to do in order to to secure your account. Secondly, you should scan your computer with a reputable anti-malware utility to check if there are any threats on it. If so, delete these threats immediately. You should also bear in mind that it is always a good idea to have a reliable malware prevention and removal installed on your PC. It will not only keep your computer clean and safeguarded, but also warn you about unsafe online content and thus help you stay away from it.